Do you have warts? Moles? Hot flashes? Cold sweats? Do you twitch? If so, you’re rather lucky not to be living in colonial America— specifically, Salem, Massachusetts, 1692—because those maladies could have marked you as a witch. Or have been perpetrated by demons. 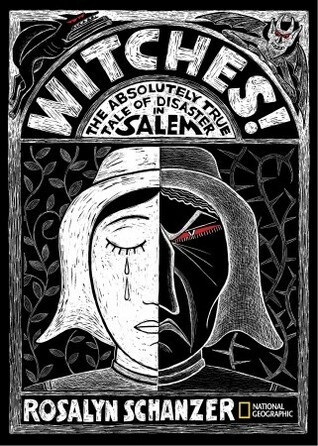 “Witches: The Absolutely True Tale of Disaster in Salem” by Rosalyn Schanzer (National Geographic 2011) is the non-fiction story of the witch-hunt that began with the mysterious illness of two cousins, Betty Parris, eight, and Abigail Williams, twelve. American Puritans of the 17th century believed the natural world was subject to forces from the “Invisible” world. Books had been written by “respectable men” about the terrifying effects of witchcraft. The fears generated by this belief moved the colonial government to create laws that made practicing witchcraft punishable by death. So when two girls began having twitching “fits” that became so violent their bodies contorted into grotesque postures, the doctors diagnosed them as being bewitched. So, the girls began accusing neighbors of being the witches who tormented them. Midwives and the homeless—the vulnerable of the community because they were without family—were first to be accused of casting spells. Officials of the church and community tried, accused, and hung a few “witches”. Crowds gathered to witness these grisly town-center affairs. More become afflicted with the twitching fits, which meant more accusations of witchcraft were made. People pointed their fingers at others to save themselves from accusation, until twenty “witches” were executed and in their wake hundreds of lives were ruined. If you were accused as a witch, you were required to pay your prison fees. If you were found guilty, your family was shunned and their property confiscated. So even years after the hysteria had died down, the families of the accused were without homes and livelihoods. The compact volume with its black and white scratch-board illustrations accented in red, rendered by the author is attractive. We’ll be seeing more books in this trim size. 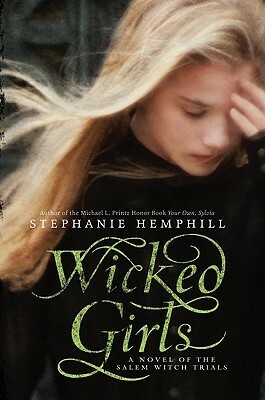 Whereas “Witches” is an older middle grade book, “Wicked Girls: a Novel of the Salem Witch Trials” by Stephanie Hemphill (Balzer & Bray 2010) is teen fiction written in free verse. Hemphill’s characters are the actual historic people. She is able to speculate as to why the girls sought attention, bringing another fascinating element to this seductive, dark, topic. Fascinating stuff Patty. In 7th, maybe 8th grade I played the part of Abigail in a college production of “The Crucible”. My parents really explained the history well. The subject of girls that age needing that kind of attention was obvious to me as a middle school teacher too, and was a very justified fear of some of the male teachers that I worked with. The principle applies, though the end result is less barbarous. Doro, you mean the male teachers you worked with were afraid they might be accused of being witches? Tormenting their young students?